SENDAI (Kyodo) A leading archaeologist admitted Sunday he fabricated the discovery in Miyagi Prefecture of stoneware at first believed to be more than 600,000 years old by burying the objects himself. Shinichi Fujimura, 50, deputy director at the Tohoku Paleolithic Cultural Research Institute, said he had made up the find as he wanted to go on record as excavating Japan's oldest stoneware. A research team led by Fujimura announced on Oct. 27 that it had discovered eight stoneware pieces that experts believed were the oldest in Japan from a layer of earth more than 600,000 years old in the Kamitakamori ruins in Tsukidate, Miyagi Prefecture. The archaeologists said the stoneware dated back to the Early Paleolithic period, as early humans such as Peking Man lived in caves. "I was tempted by the devil. I don't know how I can apologize for what I did," Fujimura said. "I was impatient that the ruins have not produced as much in findings as the Ogasaka Ruins in Saitama Prefecture," which features a layer of earth about 500,000 years old. Fujimura, a native of Miyagi Prefecture, told reporters that the new discoveries were actually objects found in earlier digs that he had planted in the 600,000-year-old layer of earth on Oct. 22. He said he went to the dig site shortly after 6 a.m. that day when nobody was around and dug holes in the ground into which he placed several stoneware pieces he brought from home, covering the holes with soil. The stoneware pieces he buried were unearthed in Miyagi Prefecture, he said, adding he kept them at home as part of his collection. Fujimura said he buried 61 of the 65 stoneware pieces excavated in the ruins so far this year. He also confessed to burying all 29 stoneware pieces that were unearthed in the Soshin Fudozaka ruins in Shintotsukawa, Hokkaido. But he claimed there were no fabrications in the discoveries of stoneware in other stoneware-producing ruins, such as the Ogasaka Ruins and the Sodehara Ruins in Yamagata Prefecture. Fujimura was often said to have "god's hands" since he has excavated most of the Early Paleolithic period stoneware found in Japan. Toshiaki Kamata, director of the Tohoku Paleolithic Cultural Research Institute, said that Fujimura was too used to unearthing artifacts, and that it was fortunate Fujimura was caught. "If the hoax had not been discovered this time, it may have further escalated," Kamata told reporters. 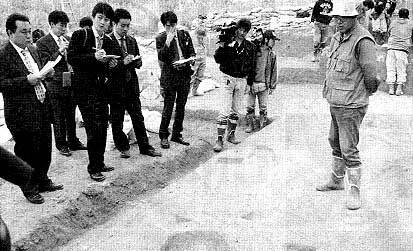 Kensaku Hayashi, a professor of archaeology at Hokkaido University, said there were rumors among experts about stoneware suddenly being unearthed when Fujimura arrived at excavation sites, despite others' difficulties in locating them. Hayashi speculated that Fujimura may have become obsessed with being the best in competitions to discover stoneware, instead of the content of research relating to such discoveries.